Despite the rise of #bodypositive or #bopo, teens are still lacking in confidence according to a new study. 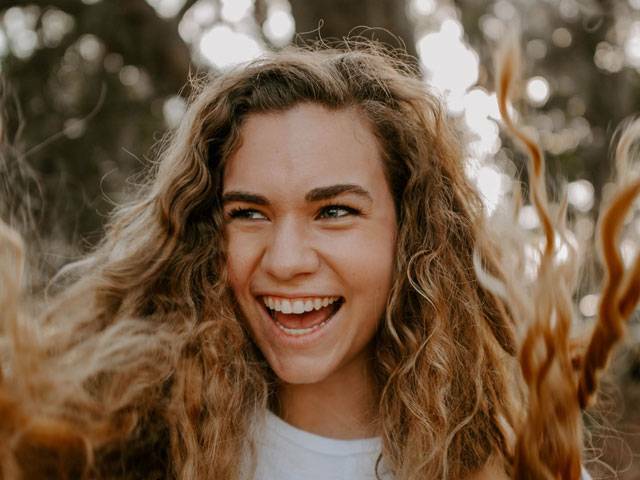 Invisalign® Australia's 2018 Teen Confidence Survey, which polled 1,000 teens and 1,000 parents of teens nationwide found that one quarter (25%) of teens don't feel comfortable in their own skin, with three in four (74%) saying this was down to the way they look. By contrast, the parents of teens polled, believed their offspring to be far more confident than they were with 84% describing their teen as confident. However, one quarter (26%) of parents believed their teens had avoided school or a social occasion because they weren't feeling confident, whilst an alarming 34% of teens admitted to this behaviour. Further, the survey found that only half of teens actually talk to their parents about self-confidence. According to child and family psychologist Clare Rowe, the results highlight a surprising discrepancy between teens' self-confidence and what their parents believe their teen's confidence levels to be. "This means that there are a significant number of teens struggling with the confidence of how they look and not making it known to those closest to them," she says. "They are likely struggling internally, and grappling with self-image issues without it being obvious to those around them." When it comes to appearance, nearly three quarters (71%) of both teens and parents believe a smile demonstrates self-confidence, yet a third (31%) of teens say they are dissatisfied with their teeth. Indeed, 1 in 3 (34%) teens admit to smiling with their mouth closed or looking away when talking or smiling. Meanwhile, 1 in 5 (22%) teens think that "changing their appearance" would increase their self-confidence. When asked what they would change, over half (51%) of teens said they would change their teeth. 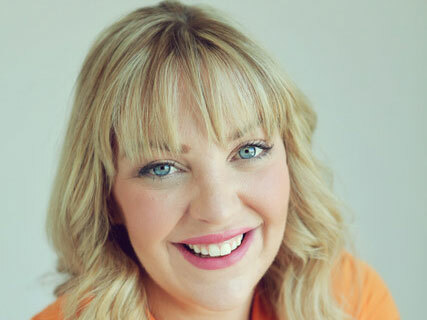 "Having a confident smile is really at the heart of self-image – When someone doesn't feel confident about their smile then that self-doubt and resulting anxiety infiltrates otherwise enjoyable social situations, making them stressful," says Clare. "I think the results from this research are quite sad - teenagers shouldn't be thinking about such issues and should be free to be themselves without the thought of covering their smile." "Teenage years have always been hard, so providing teens with an effective, easy and non-invasive way of re-aligning their teeth gives them a simple way to boost their confidence so they don't feel the need to hide every time a phone or camera phone is brought out", she says. Of those who've had tooth alignment treatment, over three quarters (77%) reported that they felt far more confident after treatment. 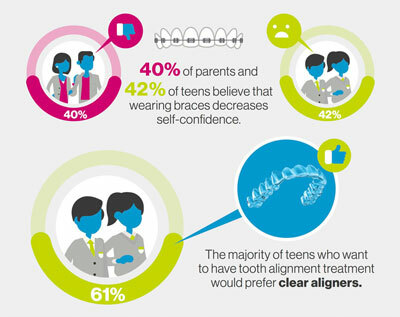 When it comes to the treatment itself, most teens who reported going through tooth alignment said they'd had braces (83%) and one quarter of these reported feeling awkward, whilst nearly half of all parents (40%) and teens (42%) believe wearing braces decreases self-confidence. Indeed, the majority (61%) of teens who want to undergo tooth alignment treatment in the future would prefer clear aligners. 19-year-old Disney Channel star and social media influencer, Ella Victoria, is unsurprised by the results, citing recent years as a teenager in the public spotlight. "Despite spending a lot of my teenage years in front of the camera, I've spent a lot of time working on my own self-confidence," she says. "To know that three quarters of teens aren't comfortable in their own skin is shocking and I want to encourage teens to start the discussion around self-confidence and lean on those around you to help build it, especially your parents or the adults in your life who have been through the same experience." Ella has just published a video to her YouTube channel of 167,000 subscribers, discussing her own experiences of being a teenager and building self-confidence. To find out more about Invisalign treatment and teen confidence, visit https://www.invisalign.com.au/. Clare Rowe is a leading child and family psychologist based in Sydney, Australia. She is a regular commentator in the media recognised for her no-nonsense approach to parenting, appearing on Channel Seven's Morning Show, Channel Nine News, radio and various magazines. She has a regular newspaper parenting column in the St George and Sutherland Shire publication The Leader. Question: What surprised you about the Invisalign Australia 2018 Teen Confidence survey? Clare Rowe: What is interesting in these results is the discrepancy between teens reported self-confidence and what their parents believe their confidence levels to be. This means that there are a significant number of teens struggling with the confidence of how they look and not making it known to those closest to them. They are likely struggling internally, and grappling with self-image issues without it being obvious to those around them. Question: How can we prevent our teens avoiding social occasions because they lack confidence? Clare Rowe: Unfortunately, while it may seem easier just to avoid situations where we feel uncomfortable due to lack of confidence, this will only make the situation worse. Teens should continue to participate in their normal social and sporting activities, and it will show them that the thing they are most worried about is not even noticeable to other people. Keep the communication open - speak to your teen regularly about how they are feeling about themselves and create a safe space where they can trust you about how they feel. Question: Why do we think that changing our appearance will increase our self-confidence? Clare Rowe: In a socially media driven world appearance and looks are unfortunately held up as a marker of success. We need to start countering this by providing other measurable areas of success - achievements in and out of school, personality attributes and goals reached. Question: How can we learn to feel more comfortable in our own skin? Clare Rowe: Sometimes this is a lifelong process! It needs to be worked on; you won't wake up feeling more comfortable over night! If you have low confidence and are a regular social media scroller, maybe try reducing the amount of time you spend looking at other people's images, or re-consider who you choose to follow. Remind yourself daily of your positive attributes - these can be both physical (force yourself to name five things you lie about your body!) and skills based (ie. achievements at school, friendship qualities and talents you have). Question: Can you provide your top tips for helping a teen build self-confidence? Clare Rowe: Confidence is related to self-esteem – that is, how good we feel about ourselves and our belief in our ability to be successful. Confidence can relate to particular skills or feeling comfortable and happy in our own skin with the way we look. Teenagers have always struggled more than any other developmental period with questioning their self-confidence as they embark on a journey of self-discovery and almost always compare themselves to their peers and what they see in social media. Raising a confident teen is important in setting a foundation for adulthood. Confidence is often related to levels of resiliency, or the ability to "bounce back" after setbacks or adversity. A confident teen is often more assertive, engaged, and able to make safe decisions for themselves. They are usually more likely to try new activities and are persistent in sticking with tasks even when things get tricky. Explain to them that making mistakes is a normal part of everybody's life – and point out examples from your own experiences. Praise the efforts, not the outcome. For example, if your teenager does not do so well in an exam, make sure you praise the time they spent studying for it and the effort they made, rather than the final mark. Communicate freely with your teen about how they feel about their self-image. According to Invisalign® Australia's 2018 Teen Confidence Survey, a quarter of teens don't feel comfortable in their own skin with only half of their teens talking to their parents about self-confidence. Something as simple as a smile you can be happy with goes a long way in contributing to overall confidence, and social satisfaction. Many parents don't realise just how their teens are feeling around these issues so raising them in a safe a non-judgmental environment is important. Many teens may not be aware that there are virtually invisible ways to now re-align teeth using Invisalign treatment that avoid the "metal mouth" attention of years gone past. Don't do everything for them. Be patient and let them figure out things for themselves, for example cooking a family meal or speaking for themselves in public. The more they are supported to take on new challenges the greater their sense of competency and therefore confidence will be. Give praise, but make sure it is sincere! Praising teenagers for their efforts and resulting accomplishments will go a long way in raising self-confidence. But be warned that teenagers are masters at detecting insincere praise and so be careful not to go overboard and make sure that you are giving specific compliments.